Perceiving is a way of acting. 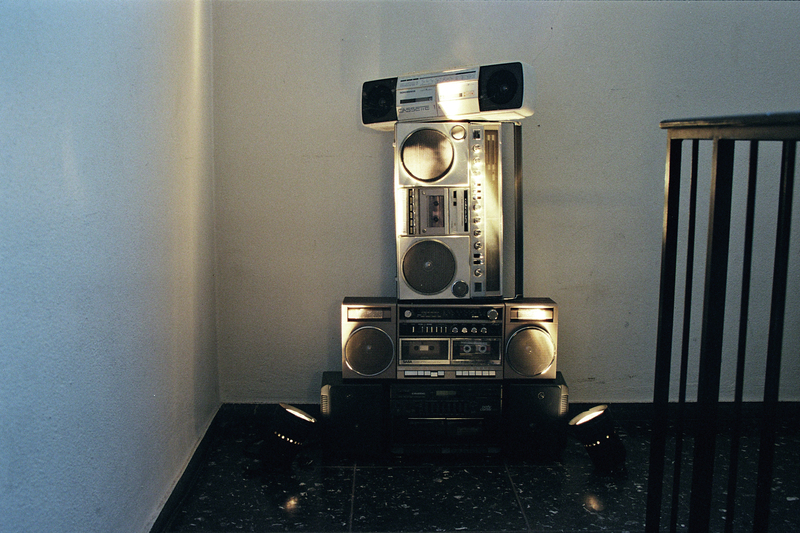 This installation is about exploring the aesthetics of room resonance while moving. I recorded various sounds when I first inspected the Lutherturm in Cologne, sounds of my movements inside of the rooms, sounds of my walking up and down the stairs, sounds of the popping noises of light switches when turned on or off. You can listen to these sounds on four ghettoblasters, that are stacked. During its monthlong display the installation will change its place repeatedly and the sounds are being played in the same rooms, in which they were recorded before. Publicly sponsored by Kulturamt der Stadt Köln. In cooperation with Transfer International (NRW-Kultursekretariat), AIC ON (Art Initiatives Cologne) and Museumsnacht Köln.